The newly-created image, shared by the ESA on Monday (December 3, 2018), is only an approximation of the sun’s north pole, but it is no less fascinating than the real thing! 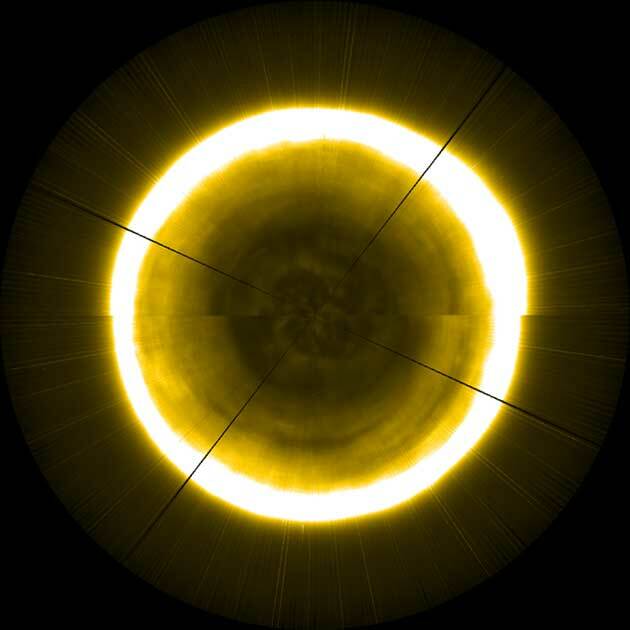 Due to a lack of imaging data from the solar poles (as most satellite missions focus on observing lower latitudes), scientists have been creating artificial images by extrapolating from imaging data collected by the PROBA2 satellite. The ESA took strips from the edge of the sun, capturing the behavior of its atmosphere in the northern hemisphere, and then stretched these strips out and laid them flat to approximate a view from above. 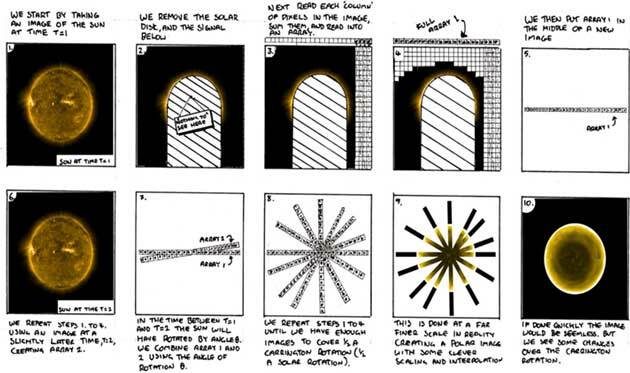 By repeating this process as the sun rotated, building up more and more strips, the researchers were able to estimate the unseen polar surface. Like the Earth, the sun has a north pole, a south pole, and an equator. But the poles of the sun are different in several ways than from the areas near its equator. 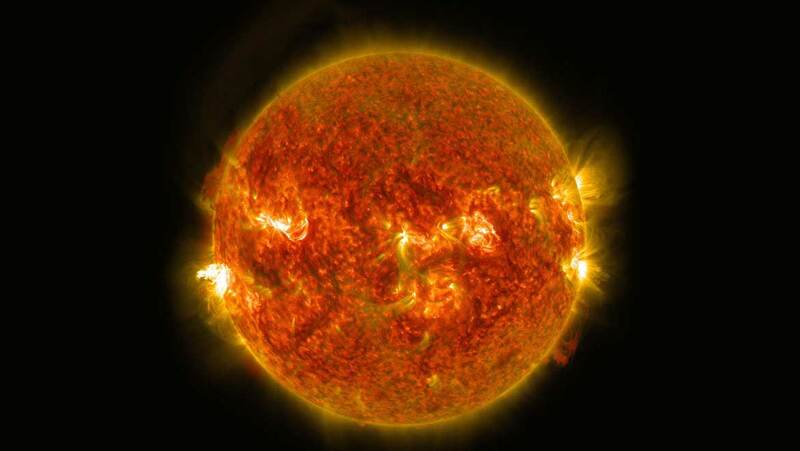 The sun is not a solid object, but a giant ball of gas and plasma. Some parts of the sun rotate more slowly than the other parts, like at the poles (at the equator, it spins pretty fast), where it takes about 34 days to spin around once. The sun's atmosphere at the poles is also different from the atmosphere above its equator. The corona, a part of the sun's atmosphere, sticks out further from the surface near the equator, but it doesn't do the same above the poles. The solar poles are relatively unexplored regions of the solar atmosphere due to a lack of satellites that have traveled over and through them. The Ulysses mission (1990-2009), a joint venture between NASA and ESA, was, truly, the only mission to explore these regions. Thanks to its orbit, Ulysses probed the sun at a range of latitudes, and between 1994 and 1995 traversed the southern and northern polar regions. The mission included several instruments that measured the in-situ plasma properties, but it did not include any imaging instruments. Portions of the solar poles can, of course, be observed with the current diverse collection of solar observing instruments, such as ESA/ROB's PROBA2 SWAP, NASA's SDO AIA and STEREO SECCHI imaging suite, amongst others. Currently, the sun can be observed through a range of wavelengths in the visible, EUV and X-ray portions of the electromagnetic spectrum. Using the technique of SWAP, data scientists are currently constructing polar images on a daily basis. The generated images, both of the north polar region, are one with the bright edge of the lower latitude sun included (left) and one with this edge removed (right). As described in the image, each picture was composed of half a Carrington rotation of individual solar images. The line seen across the middle was created due to small changes that occur in the solar atmosphere over this period. One of the most intriguing areas of potential future research revolves around the study of the polar coronal holes. Another area of interest is wave propagation in the polar regions, which has not been fully explored, especially the Alfvén wave propagation in the coronal open-field regions. On a larger-scale, global waves (Rossby-like) related to coronal hole boundaries can be studied. The ESA’s artificial images of the sun’s poles will continue to improve, but we will have to wait for the launch of the 2020 Solar Orbiter mission to get first-hand imaging data of the sun’s geographic extremes.